Showing 1 - 2 of 2 Products for Fuel Tank Vent Valve. End 1 Outside Diameter: 0.468 In. End 2 Outside Diameter: 1.653 In. 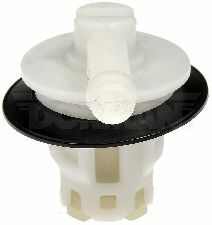 Direct-fit replacement ensures proper OE fit, form, and function. High-quality materials withstand extreme conditions. Undergoes extensive testing to ensure reliability. As a global manufacturer, we maintain complete quality control throughout the manufacturing process.